Welcome to OldEuropean.org, the collaborative Wiki project for the development of the North-West Indo-European monograph. The content of this site is based on the foundations laid out by the paper North-West Indo-European (PDF). The development of this concept of a European proto-language began rather early, with Krahe's Alteuropäisch (based on hydronymy), followed by many dialectal schemes (e.g. the one followed by Marija Gimbutas), and it was boosted by Oettinger's concept of a Nordwest-Indogermanish dialect continuum. 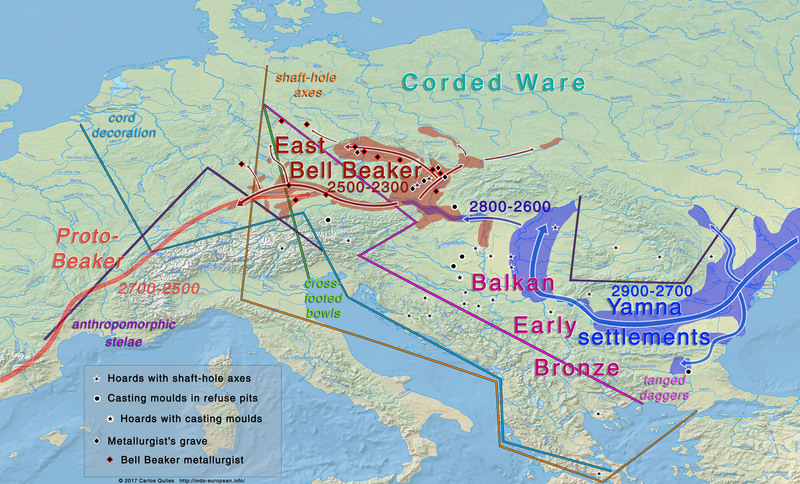 Recent genetic studies have confirmed the evolution of Yamna migrants of south-east Europe into the East Bell Beaker group, whose population expanded into central, west, north, and eastern Europe, as demonstrated in our paper Indo-European demic diffusion model. Everyone can collaborate by adding relevant linguistic data, preferably from papers published in peer-review journals, or books from reputed publishers, relevant to the most likely reconstruction of the proto-language. Also encouraged is to directly link these sources, so that the reader can find important documents easily. If you want to participate, please contact me at cquiles@academiaprisca.org to create an account. Editors with significant contributions will appear as co-authors of subsequent editions of the paper. The content is licensed under a Creative Commons Attribution-Share Alike license, so all texts of the project can be copied and continued elsewhere, at any time. This website is hosted by Academia Biblos as part of Academia Prisca's Indo-European Network. Yamna - East Bell Beaker migration 3000-2300 BC. Territories of the most likely homeland of North-West Indo-European proto-language. Adapted from Heyd (2007).